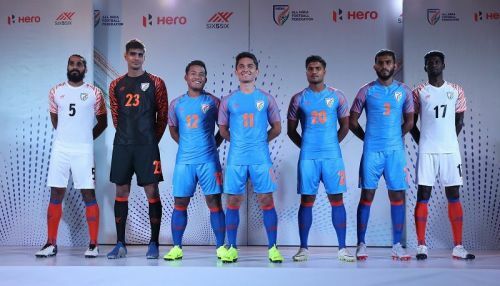 A day after their new skin was unveiled, the Blue Tigers (Indian National Football Team) landed safely in Abu Dhabi on Thursday (December 20, 2018), 17 days prior to the kick-off of the AFC Asian Cup 2019 in the United Arab Emirates (UAE). The Indian contingent was welcomed at the Airport by officers from Indian Embassy. Some fans had also dropped in to welcome their heroes. India have been drawn in Group A and play their first match against Thailand on January 6, before facing hosts UAE on January 10, and Bahrain on January 14 respectively. This is the fourth time India have qualified for the Continental Championship, the last being in Doha 2011. India will also be playing Oman in an International Friendly as part of the preparation on December 27. “We received a warm welcome from the Indian Embassy and the fans on arrival. I need to thank them for their warmth,” Head Coach Stephen Constantine said. “The mood of the camp is good and we look forward to acclimatize fast,” he added. The 28-member squad proceeded directly to the team hotel and even had a light evening session. “Everyone is excited about the prospect of playing against the best teams in Asia. It's been a long journey for us that started in March 2015,” Constantine reflected. “It is fantastic for us to be here as we deserved to be here. But now it is time to show how good we are,” he maintained. AFC Asian Cup 2019: What can India aim for?